Once the rebates are done we can fix it all together. Instead of using glue i use silicon, as it helps to seal the joints better followed by screws to hold it together while the silicon sets. Put a line of silicon along the rebate on the inside edge so that when the two pieces are joined it squeezes out, then drill and screw. About 6 screws per side should do it. 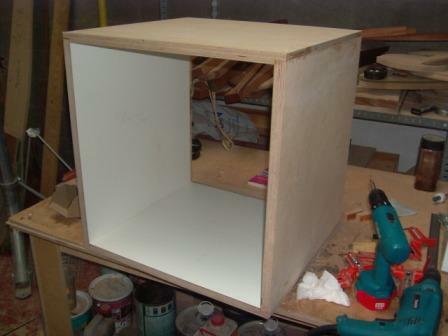 I use 3.5 x 45mm in pre-drilled holes so that they go in strait and don't split the layers of the plywood. If its done right you should now have something like this. 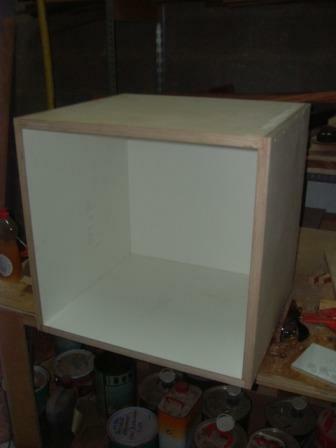 Measure between rebates on the assembled box to get the exact size of the back panel, cut out and cover with Formica, before putting in the back, turn the box door end down so that the opening for the back panel is uppermost and apply the silicon sealant all round the rebate, place the back in position and before drilling for the screws place a weight on the panel. This helps to squeeze out a bit more sealant and get a tighter joint. We can now measure the full width and hight to get the door measurements. 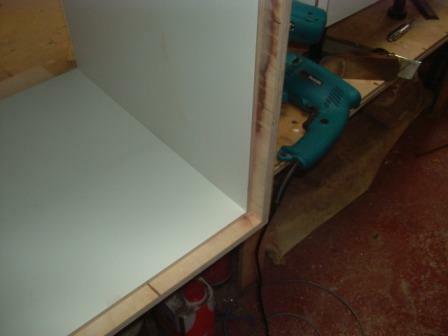 as Formica is added to the box sides and edges of the door, they will both be bigger by the same amount. Once cut and before applying the Formica we have to decide about a view window or hole. I prefer a double glazed window so I can se what's going on without opening the door and disturbing the inner atmosphere, as the moment you open the door the temperature and humidity drop very fast and take a while to build up again. NOT GOOD for the inmates.